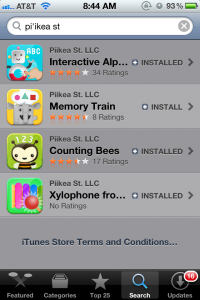 Parent’s Guide for Introducing iOS Devices (and Apps) to Kids | Pi'ikea St. This week, a number of parents will introduce their child to the exciting world of connected technology by giving them an iPhone, iPador iPod Touch. Today’s smartphones are so smart and intuitive that any youngster can become a proficient user in a matter of minutes. Here are a few tips we’ve put together to help create a fascinating, yet safe, experience for your young ones. Aside: To join in on this new gadget fun, you can enter our Color for iPods give-away for a chance to win a new 8GB iPod Touch! The drawing takes place on the last day of every month. Second, there are hundreds of new apps added every day, each with differing features and content that will need to be evaluated closely before adding to your child’s smartphone. We’re proud to say the apps created at Pi’ikea Street encourage positive interactions and good behavior, making them a safe option for parents. They are designed to be extremely kid-friendly so that kids can use and discover them on their own without parents having to worry. If you haven’t ventured very far into the app store yet, the best place to begin exploring is in the “Featured” section, which has a list of the newest apps and also “What’s Hot” (according to Apple). At the bottom of that page there is also a link to the “Education” and “Staff Favorites” sections, which bothhave great options for kids as well. 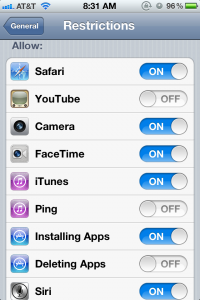 Another option for app discovery is to use the search bar to look for specific apps or app publishers. 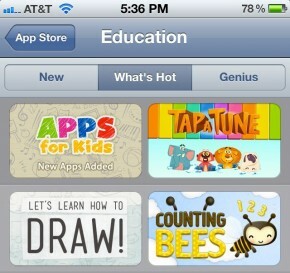 The advantages of introducing mobile devices and apps to children can be both exciting andoverwhelming. We hope this post helps you with getting your child off to a great start. To learn more about Pi’ikea Street’s apps for children, reference individual apps on the right, or head over to http://www.piikeastreet.com/apps/ for full details. Feel free to reach out to us on Facebook or Twitter and say hello! We’d love to hear from you! Wow thanks so much Maggie!